https://memphis.bintheredumpthatusa.com/home	Bin There Dump That Memphis	https://memphis.bintheredumpthatusa.com/img/franchisees/77.jpg	Contact us for more details. We are dedicated to managing and disposing of our client’s trash in Memphis in a responsible and professional manner. Are you moving in the Memphis region and need to get rid of some junk? Maybe you have a pile of rubbish around your home or office. Or maybe you have a lot of junk from your renovation project or construction clean up. Bin There Dump That provides junk and rubbish removal bins sizes 4 to 20 yards. No matter how much or how little junk or rubbish you have to get rid of, we have a bin or dumpster for you. 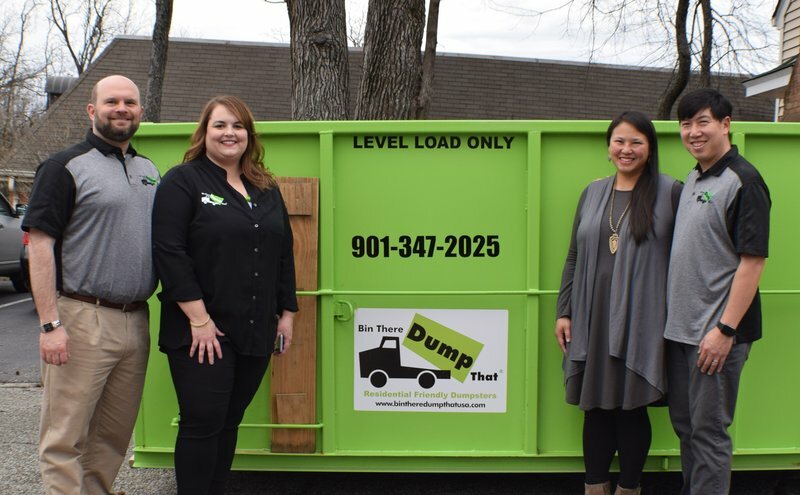 Your local Memphis dumpster rental operators are Eric & Karen Whaley, Bradley & Jennifer Chow. Tennessee - Memphis, Arlington, Bartlett, Collierville, Cordova, Germantown, Lakeland, Millington, Oakland, Piperton, Rossville, Somerville. Very professional and it was a pleasure working with you. Very timely and dependable! Highly recommend! We used them to clean up a rental property we were selling in Millington. Tried several other companies who either couldn't do same day, or didn't answer the phone. Bin There Dump That were helpful, had it there in a few hours and at a reasonable cost too. Their staff are courteous and professional and picked up exactly when they said they would. Would recommend them without hesitation. It was a pleasure to work with Karen in the office, the delivery driver and Brandon, the pick-up driver. Clean-up (after many days of rain) of silt and mud in driveway was great....far better than I had expected. Everyone I spoke with were courteous and respectful. Will definitely use again. Love the service rendered. Karen was very professional and a joy to talk to. Will use them again. I would like to highly recommend Bin There Dump That! It is a very efficient company and Karen made it a pleasurable experience. They were timely in both delivery and pickup, professional in all conversation, helpful without being pushy in desicion-making, and generous to a fault. If the need arises, I will definitely call again and would encourage anyone to do so! Thanx again, Karen and Eric!